For our That Boutique-y Whisky Co samples from Master of Malt, we deliberately focused on distilleries not yet sampled in their single malt avatar. 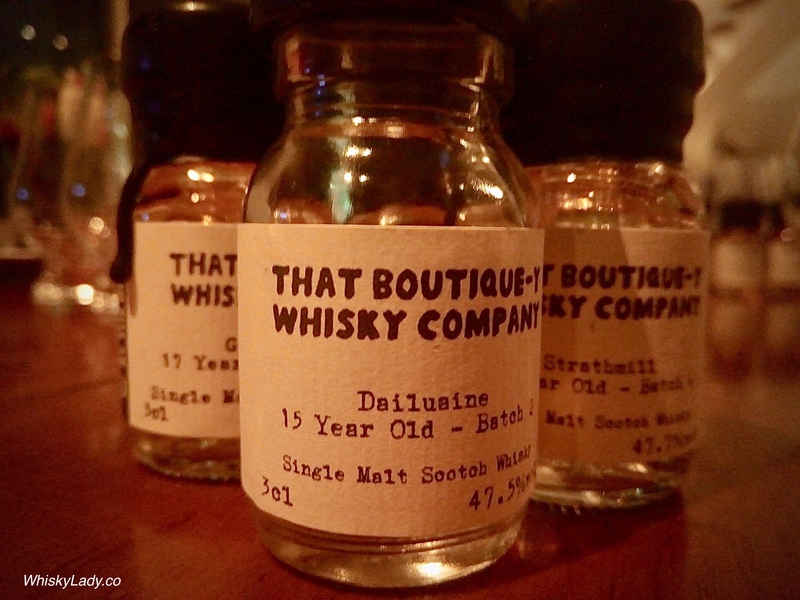 We began with a whisky from Speyside – Dailuaine. Part of Diageo stable, it is rarely seen outside blends… in 2005, it seems only 2% of the distillery’s output was bottled as a single malt. Sweet, nutty and rich.. This is not just an after dinner dram, it’s an after-dinner mood in a liquid. Thick, rich yet pleasantly, palate-cleansingly sweet. Try Dailuaine whisky with the cheese course, or just nose the cheese rind, fruit and citrus aromas hidden in its depths. What did we think of our TBWC sample? After time, yet comfortable like a cashmere sweater… even the gentle soap used to wash one too! We found the nose a bit more interesting than the palate. Overall it was an excellent introduction and a terrific way to kick off our evening! The Dailuaine distillery lives up in the Speyside region, and has done since 1852. It was home to Scotland’s first pagoda roof, an architectural element used by quite a few Scotch whisky distilleries over the course of history. Sadly, the Dailuaine pagoda roof burnt down in the early 1900s, which did stop production for a short while, but soon enough they were back to it! Interesting to note that until recently, some of the condensers at the Dailuaine distillery were made from stainless steel instead of copper, which resulted in their single malt having a touch of sulphur to it – some people are well into that, some aren’t. Our Dailuaine label features a pair of sulphur molecules, one seems to be nice and the other seems to be some sort of terrible nightmare creature from the netherworld. Steer clear of that one. Nose: Meaty at first, with leafy hints and molasses developing later on. Palate: Barley sweetness, juxtaposed intense oak spiciness. Finish: Lingering red berry and cinnamon. Depending on where you acquire it (if still available), a 50 cl bottle would set you back approximately £55. This entry was posted in Scotland, Speyside and tagged Dailuaine, Diageo, That Boutique-y Whisky Company by Carissa Hickling. Bookmark the permalink.